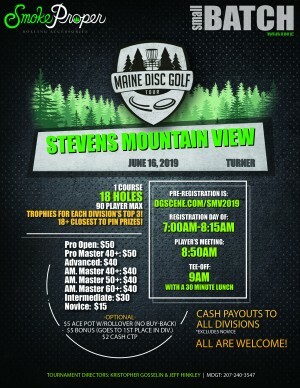 Hello and welcome to The 2019 Maine Disc Golf Tour at Stevens Mountain View Disc Golf! This is the 4th tour stop of 13 events. SMV offers a great variety of holes that will have you throwing clean short shots, and plenty of long bombs. A good mix of field and wooded challenges. Pack some over stable molds as it may be a bit windy! Small pro shop with a few discs and snacks. Players will tee-off at 9:00AM, and will have a 30 minute lunch break after the last card is officially turned in. Players will gather back at the clubhouse before heading out for their second round. After completion of the round, players will gather once again for cash and prizes to be awarded. From Lewiston: Take ME-4 N/Turner Rd. for 4.3 miles and turn right on Upper St. Go 2.9 miles and turn left onto Pearl Rd. Destination will be on your left. 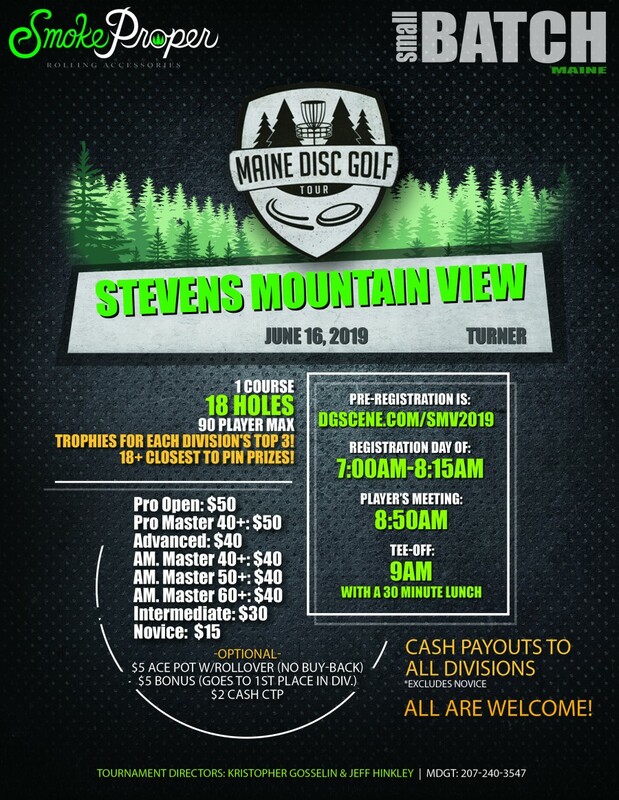 Maine Disc Golf Tour is responsible for all refunds/cancelations.